Many people have the experience of scratching their DVD discs while handling them. Slight scratches might not have actual damage to the data on the disc, but severe scratches might damage the disc permanently. DVDs need to be handled with extra care in order not to leave scratches on them. Due to the fact that the data on the disc are packed densely, a severe scratch might render the DVD useless. Scratches can cause a lot of playback problems like skips or distortion. Some might even stop the playback. And not only scratches have those negative effects on the DVD, fingerprints, grease, dust and other debris can also make the playback intolerable. If you don’t want things like that happening to your DVD collection, then you should either take extra care of your DVDs or make a backup of them so that when the original discs fail, you have something to fall back on. In this post we will be focusing on teaching Windows 8 users how to directly copy a DVD to a new re-writable disc. Copying a DVD disc is fairly easy if you got all the things needed for the process right. For people who have never done this before, there are a few things they should prepare. Here’s what they are. 1. You are going to need two DVD drives in order to copy a DVD directly to another DVD. And as it involves disc burning, you are going to need a DVD drive that can burn DVDs. 2. A powerful piece of DVD copy software is needed in order to create a high-quality or even lossless copy of your DVD collection. 3. One or more re-writable DVD discs for copying your DVD collection to. You can get them from places like Amazon, BestBuy or eBay. If you currently don’t have the things listed above at your command, check out our recommendations below. Below are several DVD drives that are capable of burning DVD discs. Check them out one by one and find one that you think is most suitable for you. This VersionTECH DVD drive can work with Windows 98/SE/ME/2000/Xp/Vista/7/8/10 and all versions of macOS. Thanks to its great compatibility to different operating systems, you can still use it when you decide to upgrade or make the switch to macOS from Windows 8. It’s powered by the USB port of your computer and it doesn’t require a specific driver program so you can just directly plug it in and start using it immediately. The sliver color coating gives it a sleek look and it’s a very thin and lightweight drive, making it easy to be carried around. The LG GP65NB60 External Drive has a slim and premium body that makes it easy for users to carry it around. You can easily fit it in your backpack with your laptop. 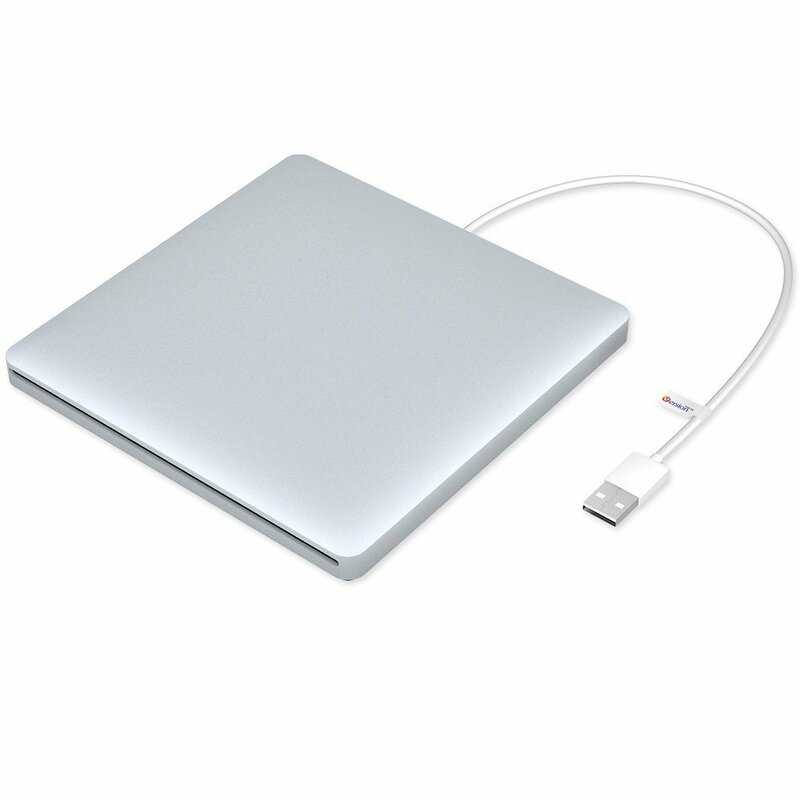 It has USB2.0 interface compatible with USB3.0. The maximum 8X DVDR write speed and 24X CD write speed can make sure you can have your DVDs copied quickly. It’s also directly powered by USB port so no extra power supply needed. 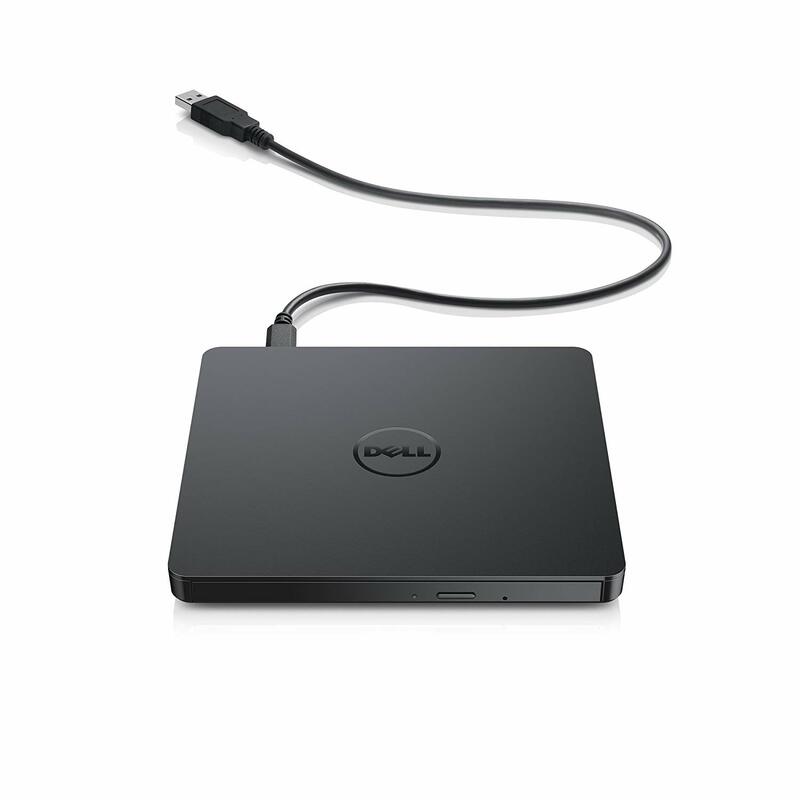 This Dell USB DVD drive is a slim and sleek-looking device that looks great when placed side by side with most laptops. It has the pre-loaded CyberLink Media Suite to help you play and burn DVD/CDs. The 8X DVD read speed and 8X DVDR/6X DVDR DL write speed guarantee you it will get the job done fast. The DVD copy software we will be using is called Leawo DVD Copy. There are a few things needed in the DVD copy software we use. First, it needs to be able to directly copy a DVD disc to a new disc. It should be able to copy the original DVD disc to a re-writable disc with no quality loss. And Leawo DVD Copy has all the things we need in DVD copy software. It allows you to directly copy a DVD disc to another disc provided that you have two disc drives to use. It can perform 1:1 lossless DVD copying as long as you have a re-writable DVD disc with the same capacity as the original disc. You can use it to copy DVD-9 to DVD-9 losslessly, compress DVD-9 to DVD-5 or copy DVD-5 to DVD-5 with no quality loss. 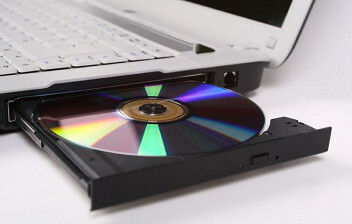 You can use it to back up your DVDs to your computer hard drive by converting the DVD content to a DVD folder or a DVD ISO file. It’s also capable of directly copying one disc to another. 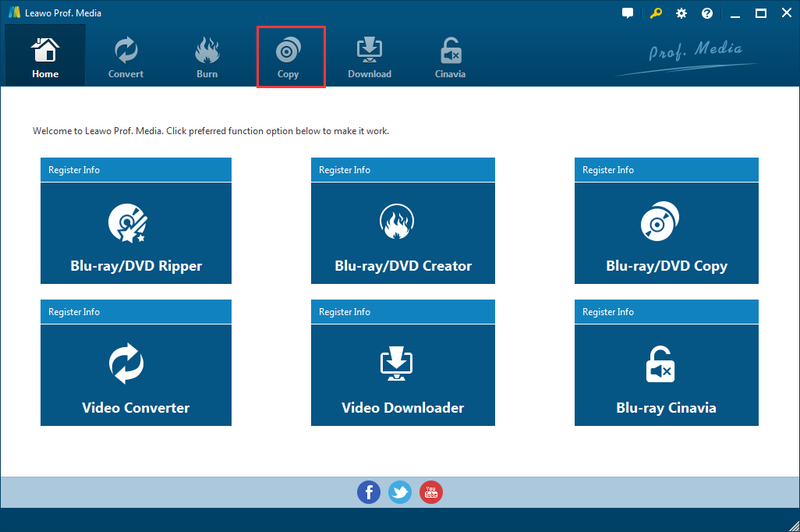 Below is how to copy DVD to DVD in Windows 8 using Leawo DVD Copy. Note: After years of development, Leawo DVD Copy has now become a part of Leawo’s software package called Leawo Prof.Media. Step 1. Put the DVD disc you want to copy in your disc drive and put the re-writable DVD disc in your DVD burner. Step 2. 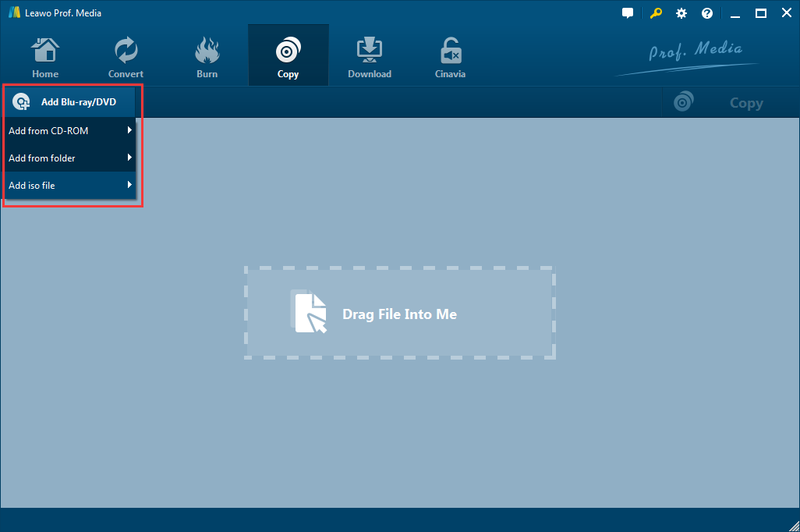 Launch Prof.Media from your desktop and click the DVD Copy button in the lower-left. And then you will enter the interface of Leawo DVD Copy. Step 3. Click the Add Blu-ray/DVD button from the upper-left and continue to click Add from CD-ROM. On the following menu, click the option with the name of the original disc to import the DVD content in the original disc to Leawo DVD Copy. Step 4. After the program finishes loading DVD content, click the DVD-5 button in the bottom-left corner. On the following menu, select either DVD-9 or DVD-5 according to the capacity of the original disc and the re-writable disc. Step 5. Use one of the provided copy modes to select the content in the disc to copy to the re-writable DVD. The Full Movie button will directly have all the content selected, so when the copying process starts, all the videos, subtitles and audio tracks in the original disc will be copied to the new disc. If you use Main Movie, then the program will only copy one video: the main movie. And you only get to choose one audio track and one set of subtitle for the movie. And Custom Mode lets you select the said contents freely by yourself. You can use the video player on the right to play the videos in the disc when you are not sure if the videos you’ve chosen are the right ones. Step 6. There’s a Copy button above the top-right corner of the video player. Click on the Copy button and you will see a sidebar coming up above the player. The 3 options on top of the sidebar are for you to decide where to copy the disc to and what form the copy will be. As you are attempting to copy a DVD directly to another DVD, you need to check the third option. After checking it, click on it to display a drop-down menu. On the menu you can see all the DVD drives connected to your computer, you need to select the drive with the re-writable DVD in it. And then you can directly click the Copy button at the bottom of the sidebar to start copy the DVD disc. Note: If you want to back up your DVD disc to your computer, just check the Folder or ISO file option on the top, set where to save them on your hard drive in the output directory box below the Save to label and start the copying process by clicking the Copy button. 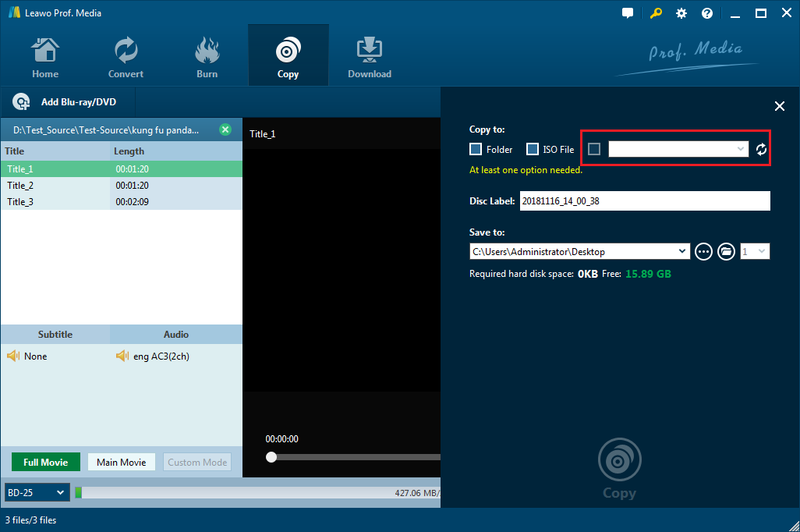 Leawo DVD Copy is one of the best and easy-to-use program to copy DVD Windows 8 users could find.If you prefer a more intuitive guide, check out the video tutorial of Leawo DVD Copy below. To keep a DVD disc playable for a long time is no easy task. Below are several tips on protecting your DVD disc during daily use. Hope it could help making the lifespan of your DVD collection longer. Tip 1. Do not place the disc down on any surface that might scratch the surface of the disc. Tip 2. Keep the disc as clean as possible. Keep it away from dust and dirt by using a suitable case. Grease will also have negative effects on the DVD playback, so when getting it into/out of the case, be more careful and avoid touching the surface with your fingers. Tip 3. A DVD disc could be rendered unusable when exposed to intense direct light. So remember to store it in a suitable place to keep it away from that. Tip 4. When a disc is having playback problem, try fixing it with commercial cleaning or scratch-repair products. “How do I copy a DVD in Windows 8?” After reading this post, you should find the answer to that question. Leawo DVD Copy is compatible with Windows 7/8/8.1/10 so you can also use it to copy DVD in Windows 8.1 or above if you need.